Looking over last month's posts with an eye for 2-3 themes to extract for my recap post today, I was instead struck by one overarching theme: innovation is alive and well in the broadband video space. Other sectors of the economy may have ground to a halt in the current recession, but whether it's new technologies, new service models or new approaches by traditional media companies, the pace of innovation in all things related to broadband video seems only to be accelerating. Now granted I have an eye out for broadband innovations so this list is somewhat self-serving. But remember that for every item above I was probably pitched on 2-3 others that I didn't write about due to time limitations. Some of these other items may have been picked up by other news outlets and captured in the news aggregation side of VideoNuze, while plenty of them likely received little attention. My point is that throughout the whole broadband video ecosystem there is a vibrant sense of entrepreneurialism that is slowly but surely remaking the traditional video landscape. To be sure, not all of this stuff is going to work out; either business models will be faulty, technologies won't deliver as promised or consumers will reject what they're being offered. Nonetheless, from my vantage point, the wheels of innovation continue to spin faster. That makes it a very exciting time to be part of the industry. Given the pervasiveness of gloomy economic news, I'm always on the lookout for evidence of growth, especially in the broadband video space. That's why news that TurnHere, the broadband video production and advertising company, shared with me last week caught my attention. The company will report later this morning that its business has doubled in '09 vs. '08. John McWeeny, TurnHere's COO briefed me last week on what's behind the improved numbers. Understanding TurnHere's model offers plenty of lessons for other broadband video market participants. As background, TurnHere has developed a global network of 7,000+ independent filmmakers, which it taps into for soup-to-nuts creation of made-for-broadband content for its clients. TurnHere only accepts into the network well-credentialed professionals who are thoroughly vetted. The company's clients come from two sources. First, from channel resellers, who are primarily Internet Yellow Pages companies selling online ads to local businesses that increasingly want a video presence online. And second, through direct sales to brands who increasingly want to capitalize on video's impact on their web sites. '09 growth is coming in equal parts from both sides of the business. Listening to John describe TurnHere's business, I was repeatedly struck by the fact that this is a pretty complicated business to run successfully. Clients are in multiple locations, necessitating multiple filmmakers to be involved in projects. Yet brand standards and formats must be adhered to for consistency across videos. And often there's a 3rd party agency or marketing/online consultant involved that must be pleased as well. Tight budgets and timelines are the norm. So making all this work is not trivial. In fact John remarked that one of the company's core competencies is "how to leverage a distributed network of creative people." That seemed like a spot-on assessment to me. To succeed, TurnHere has developed strict internal policies and procedures to guide its work. 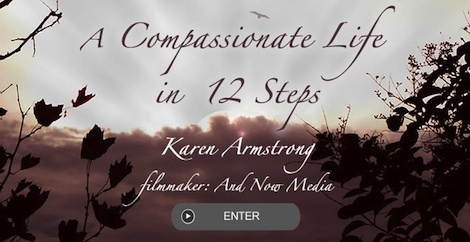 Everything from recruiting filmmakers to selecting them for projects to scoping the project with clients to managing the video production process to reviewing filmmakers' work has some formal structure around it. John explained a key differentiator for TurnHere is its laser focus on video that is made-for-broadband. The company is not aiming to make commercials that run on-air and cost hundreds of thousands of dollars. Rather, it looks to produce high-quality, yet inexpensive shorts in a documentary-style, with real people, not actors. The result is that for clients used to getting just one ad for their budget, they are now getting dozens or even hundreds of web-only videos. TurnHere's surging business is due to more marketing executives opting to allocate budget to the new broadband video medium to reach their target audience vs. following traditional TV advertising rules. When you read research about ad budgets shifting to online, TurnHere is right on the front lines of making this happen. The company has done work for brands like InterContinental Hotels, Williams-Sonoma, American Express and others. Emphasizing attributes like process development, specialization, customization, flexibility, affordability, reach and quality are the reasons TurnHere is succeeding, despite the down economy. In fact, a lot of what John said echoed what Demand Studios' EVP Steven Kydd told me recently. Demand Studios too is focused on building processes to crank out large volumes of high-quality web-only video. Yesterday's post on how SundaySky is enabling automated video from web-based content is yet another example volume-based video production. The common themes here are that broadband video is a different medium than TV. People who want to succeed in the broadband video medium - whether as content providers themselves or in service to content providers or brands - need to recognize the differences and engineer their businesses appropriately. Scale and cost-efficiency matter a lot more in broadband than they did in TV where expensive, hand-crafted video was the norm. In this context, learning how to blend technology with creative talent is going to be a real competitive differentiator. Citysearch, the big online local information company, is making an aggressive push into video. The company is currently running a new promotion which allows its merchants to have a complimentary video made for them, which enhances their Citysearch listing, and can also be used on their own web site and on YouTube. I'm always on the lookout for ways video can drive more revenue, and Citysearch's effort (originally begun in early '07) qualifies on at least two levels. First, it's a valuable enhancement to Citysearch's pay-for-performance ad model, increasing the ARPU the company derives from its merchants. Second, it appears to be a bona fide differentiator for merchants in helping them attract new business. 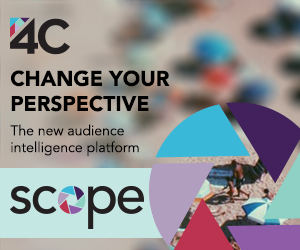 And of course it helps deliver on users' growing expectations for video experiences. Last week I spoke with Brian McCarthy, Citysearch's VP of Merchant Product to learn more about how the program works. 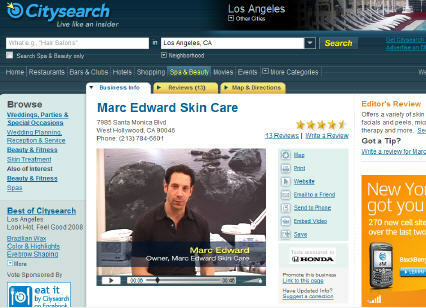 I also spoke to Marc Edward, who runs Marc Edward Skincare in West Hollywood, CA, which is a merchant that's been offering video in its Citysearch listing for over a year. Under the current promotion, Citysearch will make a 60-90 second video for its merchants for no cost to them. Citysearch has partnered with 3 production firms, TurnHere, StudioNow and GeoBeats to produce the video, which Brian said cost under $1,000 apiece. The merchant is involved in the editing process and then the video is added to the merchant's listing. When a user watches the video for at least 10 seconds, the merchant is charged a fee ranging from $.40 to $2.00, as part of Citysearch's "multimedia package." Marc was one of the early users of Citysearch video and is quite enthusiastic about the results. He feels that nothing can convey what his business is about better than prospects actually seeing him talk about it, and explaining what they can expect. While he hasn't tracked new business directly to the video he offers, anecdotally he said new clients mention and cite the video as a major reason why they chose his shop over others. While it's still early days for video enhancements in local listings/search results, it seems like a natural way to extend the model. Other local players like WorldNow, CBS and other broadcasters are on to this as well. The key is getting the financial model right for all parties: who pays to get the video made and how it generates a return over time. Citysearch seems to be making progress proving how the model can work.